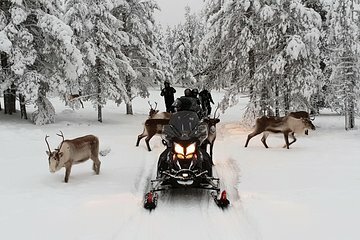 This snowmobile safari adventure is ideal for travelers interested in seeing Lapland’s impressive outdoor beauty. Take the worry out of impacting the natural environment by going on an emission-free eSled. You’ll access remote landscapes that would be hard to reach alone, such as Lake Lehtojarvi, and a hunting cabin in the middle of the forest. Curb your hunger with a delicious feast of sausages, cookies, and hot juice.